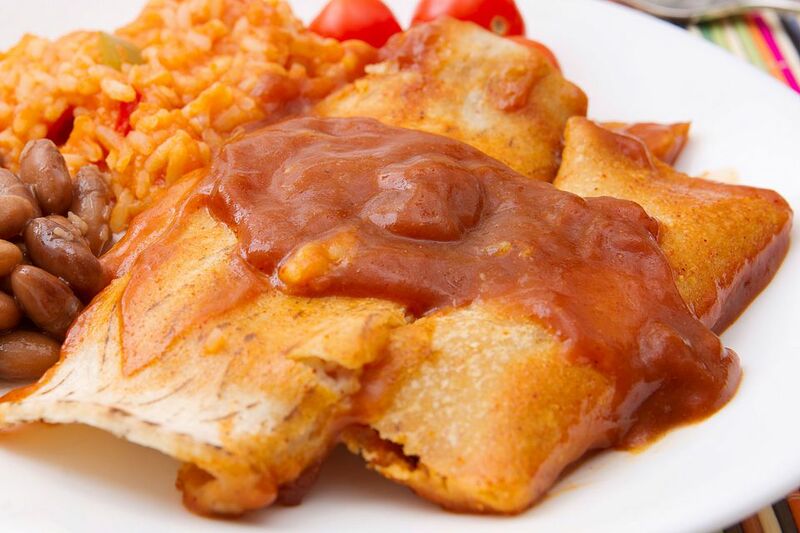 This authentic enchiladas rancheras dish combines two wonderful genuinely Mexican foods: stove-top enchiladas and ranchera sauce. The sauce’s pronounced tomato flavor is delicious when served over these cheese-stuffed enchiladas that are cooked in the traditional way–in a pan, not baked in the oven. Place the dried red chile in a bowl and cover it with hot water. The chile may float to the top, and that is okay as it will still absorb the water. Let the chile soak for 10 to 20 minutes. While the chile pepper is soaking, begin preparing the sauce. To start, peel and dice the onion. Prepare the tomatoes by cutting out the stem portion and roughly chopping the tomatoes. Cut the stem off of the bell pepper and cut the pepper into quarters lengthwise. Scrape out the seeds and discard them. Then dice the green bell pepper. Peel the cloves of garlic and roughly chop them. When the chile is softened, cut the stem off with a knife or a pair of kitchen scissors. Cut the chile lengthwise to open it up. Use a spoon to scrape out the seeds and white stringy areas and discard them. Cut the chile into long pieces about 1/4 inch across, and then cut the strips into 1/4-inch-size pieces. Heat the two tablespoons of oil or lard in a large saucepan over medium heat. Swirl the melted fat around the pan to coat it. Add the chopped onion and green bell pepper and cook them until they begin to soften after about three minutes. Add the tomatoes, red chile, garlic, cumin, and oregano and cook for an additional five minutes, stirring every minute or so and adding salt and pepper to taste. Then cover the pan and keep it over low heat to stay warm while you prepare the tortillas. Note: If you prefer a smooth version of the sauce, you can use a handheld immersion blender to blend it in the pan until it reaches your desired consistency. If using a jar-style blender, let the sauce cool to near room temperature before attempting to blend it. You can then reheat the sauce over low heat. Add enough of the remaining cooking oil to a medium-sized frying pan to coat the bottom by about 1/8 inch. Heat the cooking oil over medium-high heat. Place a tortilla in the hot oil, and cook it for about 10 to 15 seconds. The oil should be barely sizzling. Flip it over and add 1/4 cup cheese down the center. The cheese will begin to melt. Cook the tortilla for about another 10 seconds and then remove it from the pan and place on absorbent paper to absorb some of the oil. Wrap one side over the cheese, and then the other side, so that the cheese is now rolled up inside of the tortilla. Quickly cook another tortilla and cheese, place it next to the other one on the paper towels to absorb some of the oil, and then place both hot tortillas on a serving plate. The cheese will continue to melt in the hot tortillas. Continue until all tortillas have been cooked, adding more oil as necessary. Spoon about 1/2 cup of the sauce over the two cheese-stuffed tortillas and serve immediately. If you need to make a large batch, keep the cooked cheese-stuffed tortillas in a baking dish in a warm oven (about 200 F/93 C) for up to 30 minutes. These enchiladas are great plain or topped with pourable cream, guacamole, and/or a sprinkle of chopped fresh onions and fresh cilantro leaves. Serve alone on the plate on alongside some Mexican rice and/or beans.